On 16th October 2014, in line with manufacturers such as LG and Samsung, Apple released their first PC to feature a high-resolution Retina screen - the Apple iMac Retina - heralding a new era of hi-res displays. 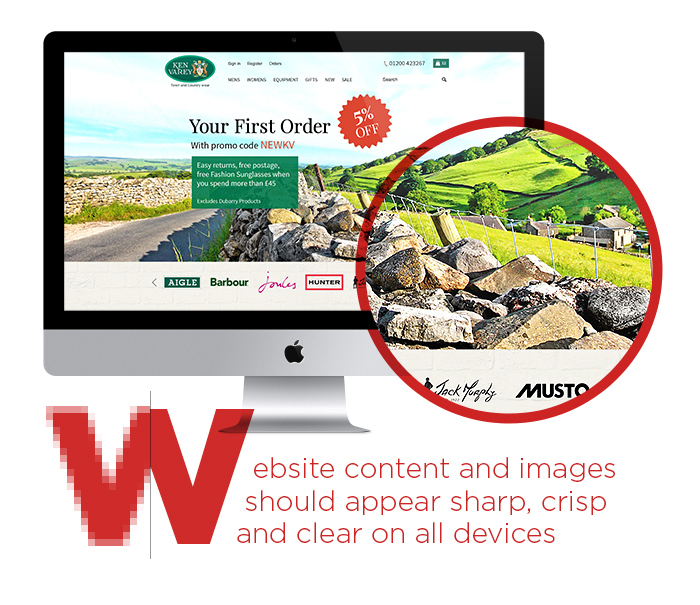 This means that websites will have to follow suit and must display sharply, crisply and clearly across all devices. The first high-resolution screens appeared in 2012, with the first being on Apple’s iPad Retina and then quickly followed by other manufacturers for both tablets and smartphones. Later, notebooks with hi-res displays, such as Google’s Chromebook, Apples MacBook Pro Retina and Windows devices, were released, causing a new generation of websites to be produced using a range of innovative web development techniques..
Hi-res screens, now available on any type of internet-capable device, require hi-res websites. Current Brick technology clients already enjoy websites that display optimally on Retina screens and have done since the concept was introduced - Brick technology are always quick to respond to the introduction of new technologies and began creating hi-res websites as soon as the technology became available back in 2012. As the Retina screen on the new generation of PCs is much larger than that of a smartphone or tablet, there is even less room for error when presenting your business online to an ever-more discerning array of internet users. Websites that look and feel what is now considered to be old-fashioned require a complete overhaul to ensure that they remain competitive in the crowded online marketplace. To complement your responsive, modern and hi-res optimised website, Brick technology offer a complete Media Production facility including professional photography, video and animation services designed to present your company and its products and services at their very best. A virtual shop window that invites visitors to browse and buy inside, your ecommerce website needs to be ready for the hi-res revolution. Ready to upgrade your website? Call Brick technology today on 01254 277190 or email info@brickweb.co.uk to arrange a consultation and review.